What to do with with left over little bits of yarn? Here is one idea. 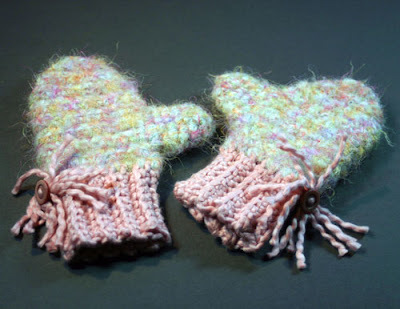 It doesn't take much to make a little pair of mittens. These toddler size mittens where made with bits of two different yarns. I used this free crochet pattern from Lions brand yarn as a guide making just one or two minor adjustments for the materials I was using. I added the buttons and tassels for fun. I think they are cute as can be. Now my hands may are small but these are for tiny little toddler hands, so they have been packed up and sent off to a little girl in a cold place. I hope she enjoys them. Fill our heart with sunshine and good thoughts!